Abdominal angina is defined as the postprandial pain that occurs in individuals who have mesenteric vascular occlusive disease that has advanced to the point where blood flow cannot increase enough to meet visceral demands. This mechanism is similar to that of the angina pectoris that occurs in individuals with coronary artery disease or the intermittent claudication that accompanies peripheral vascular disease. Schnitzler first described the clinical picture of postprandial pain in 1901. However, the true description of postprandial abdominal angina is attributed to Baccelli or Goodman (1918). In 1957, Mikkelsen proposed surgical treatment of occlusive mesenteric vascular disease. Shaw and Maynard reported the first transarterial thromboendarterectomy of the superior mesenteric artery (SMA) in 1958. With the advancements in imaging technology, the degree of stenosis in mesenteric arteries can be defined accurately and treated accordingly. The three arteries supplying the gut are the celiac artery, the SMA, and the inferior mesenteric artery (IMA; see the image below). 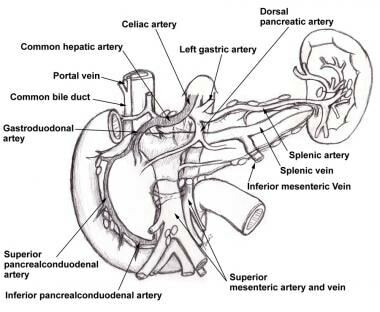 There are collaterals between the celiac artery and the SMA (pancreaticoduodenal arcades) and between the SMA and the IMA (meandering mesenteric artery). In cases of severe ostial narrowing, internal iliac arteries also serve as important sources of collateral hindgut and midgut perfusion in the presence of IMA occlusion. 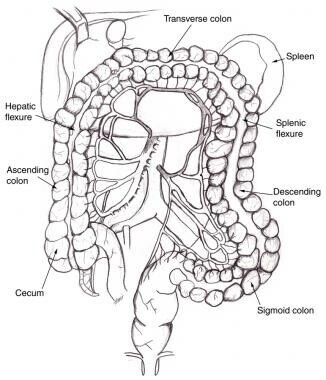 Superior mesenteric artery and inferior mesenteric artery share collateral circulation near splenic flexure of colon. When dilated, this vessel is termed meandering mesenteric artery. As seen on angiography, this is sign of chronic mesenteric ischemia. Pancreaticoduodenal arcades are collateral pathways between celiac artery and superior mesenteric artery. SMA occlusion almost invariably is observed in patients with symptomatic occlusive mesenteric ischemia. Within a few minutes of eating, there is increased blood flow in the celiac and superior mesenteric vessels in normal individuals. Patients with abdominal angina are unable to sufficiently increase flow in the mesenteric vessels. This leads to fear associated with eating and significant weight loss. The syndrome is extremely rare, and the true incidence is unknown. The mean age of affected individuals is slightly older than 60 years. Median arcuate ligament syndrome (see Pathophysiology and Etiology) has been reported in young individuals. In contrast to the usual male predilection of atherosclerotic vascular disease, females outnumber males by approximately 3 to 1 in most series. No data are available regarding relative incidence figures among different races. Surgical management is the criterion standard for treatment of this disease. Despite advances in surgery, the mortality associated with acute mesenteric ischemia is in the range of 60-95%. Reocclusion is more prevalent in males than in females. Several series have demonstrated that 86-96% of patients remain asymptomatic at 5 and 10 years, with similar graft patency rates. Cai et al carried out a meta-analysis comparing the clinical outcomes of endovascular revascularization for chronic mesenteric ischemia with those of open revascularization. The two approaches were similar with regard to 30-day mortality and 3-year cumulative survival rate. The endovascular approach was associated with a lower rate of in-hospital complications but a higher rate of recurrence within the 3 years following revascularization. Gossman WG, Bhimji SS. Angina, Abdominal. Treasure Island, FL: StatPearls; 2017. [Full Text]. Tyson RL. Diagnosis and treatment of abdominal angina. Nurse Pract. 2010 Nov. 35 (11):16-22; quiz 22-3. [Medline]. Moschetta M, Stabile Ianora AA, Pedote P, Scardapane A, Angelelli G. Prognostic value of multidetector computed tomography in bowel infarction. Radiol Med. 2009 Aug. 114 (5):780-91. [Medline]. Sarac TP, Altinel O, Kashyap V, Bena J, Lyden S, Sruvastava S, et al. Endovascular treatment of stenotic and occluded visceral arteries for chronic mesenteric ischemia. J Vasc Surg. 2008 Mar. 47 (3):485-491. [Medline]. Sundermeyer A, Zapenko A, Moysidis T, Luther B, Kröger K. Endovascular treatment of chronic mesenteric ischemia. Interv Med Appl Sci. 2014 Sep. 6 (3):118-24. [Medline]. Cai W, Li X, Shu C, Qiu J, Fang K, Li M, et al. Comparison of clinical outcomes of endovascular versus open revascularization for chronic mesenteric ischemia: a meta-analysis. Ann Vasc Surg. 2015 Jul. 29 (5):934-40. [Medline]. Fields JM, Dean AJ. Systemic causes of abdominal pain. Emerg Med Clin North Am. 2011 May. 29 (2):195-210, vii. [Medline]. Danse EM, Kartheuser A, Paterson HM, Laterre PF. Color Doppler sonography of small bowel wall changes in 21 consecutive cases of acute mesenteric ischemia. JBR-BTR. 2009 Jul-Aug. 92 (4):202-6. [Medline]. Pellerito JS, Revzin MV, Tsang JC, Greben CR, Naidich JB. Doppler sonographic criteria for the diagnosis of inferior mesenteric artery stenosis. J Ultrasound Med. 2009 May. 28 (5):641-50. [Medline]. Cunningham CG, Reilly LM, Rapp JH, Schneider PA, Stoney RJ. Chronic visceral ischemia. Three decades of progress. Ann Surg. 1991 Sep. 214 (3):276-87; discussion 287-8. [Medline]. [Full Text]. Thomas JH, Blake K, Pierce GE, Hermreck AS, Seigel E. The clinical course of asymptomatic mesenteric arterial stenosis. J Vasc Surg. 1998 May. 27 (5):840-4. [Medline]. Schermerhorn ML, Giles KA, Hamdan AD, Wyers MC, Pomposelli FB. Mesenteric revascularization: management and outcomes in the United States, 1988-2006. J Vasc Surg. 2009 Aug. 50 (2):341-348.e1. [Medline]. [Full Text]. Kamana VK, Shetty R, Krishnan AM, Rao MS, Malpe UP. Abdominal Angina Treated by Urgent Percutaneous Angioplasty: An Excellent Alternative to Surgical Revascularisation. J Clin Diagn Res. 2016 Nov. 10 (11):OD03-OD04. [Medline]. [Full Text]. Aksu C, Demirpolat G, Oran I, Demirpolat G, Parildar M, Memis A. Stent implantation in chronic mesenteric ischemia. Acta Radiol. 2009 Jul. 50 (6):610-6. [Medline]. Oderich GS, Erdoes LS, Lesar C, Mendes BC, Gloviczki P, Cha S, et al. Comparison of covered stents versus bare metal stents for treatment of chronic atherosclerotic mesenteric arterial disease. J Vasc Surg. 2013 Nov. 58 (5):1316-23. [Medline]. Lateral aortogram shows abrupt cutoffs at origin of visceral vessels and tapered occlusion of distal aorta. Because these vessels originate from anterior surface of the aorta, stenoses and occlusions are not observed clearly on standard anteroposterior views. Arteriogram illustrates meandering mesenteric artery. Appearance of meandering mesenteric artery such as this one supports diagnosis of chronic mesenteric ischemia. Celiac artery is exposed at its origin in preparation for antegrade bypass. Superior mesenteric artery and several branches are exposed for antegrade bypass. Antegrade bypass from aorta to superior mesenteric artery (SMA) and celiac artery (SMA anastomosis is shown) using Dacron graft. Completed retrograde bypass to superior mesenteric artery using expanded polytetrafluoroethylene graft material. Image courtesy of Jamal Hoballah, MD, University of Iowa College of Medicine. Possible incision for trapdoor aortotomy. Plaque at orifices of visceral vessels is removed after trapdoor incision is lifted. When satisfactory endarterectomy has been achieved, trapdoor is sutured shut. Completion duplex ultrasonographic study shows excellent flow at distal anastomosis. Upper gastrointestinal series (barium swallow) shows ulcer. Disclosure: Received honoraria from BMS for speaking and teaching; Received consulting fee from BMS for consulting; Received grant/research funds from BMS for research studies; Received honoraria from Covidien for speaking and teaching; Received consulting fee from Covidien for consulting; Received honoraria from Otsuka for speaking and teaching; Received honoraria from Sanofi/Aventis for speaking and teaching; Received consulting fee from Sanofi/Aventis for consulting; Received grant/research funds from Sa. We wish to thank Carol EH Scott-Conner, MD, PhD, and Beth Ballinger, MD, for their previous contributions to this article.